So the Professor is officially a "tweenager". I knew it was coming. When his shoes came in bigger boxes than his dad's and he started getting closer and closer to looking me in the eye. Sigh. OK, back to the party... we all woke up a little late thanks to a late night taking care of a puppy with tummy trouble. 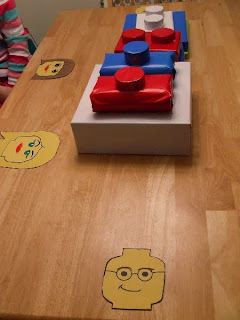 The kids found their personalized mini-fig heads on the table and got busy working on the rest. Some of his gifts were wrapped to look like LEGOS. I just used these little pillboxes and taped them on top. Here is the birthday guy standing tall and standing small! 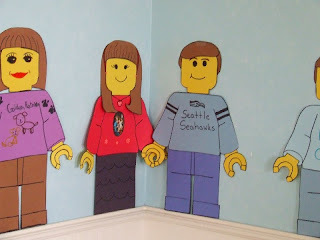 On the walls, we taped construction paper pieces together to make the number 12. It wasn't that hard to figure out since I made a smaller version for the cake first. All of my kids are fascinated with my ability to arch my eyebrows, one at a time. Sunshine has been working on it especially hard lately which means just about every time I turn around, I see this face and crack up! She is my Sunshine, my only Sunshine! When it came to the cake I figured he would want something like this or this. 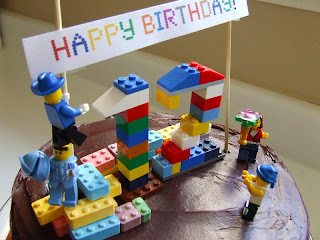 I was surprised when he said, "How about you just put some LEGOS on a cake?" OK. That's easy. 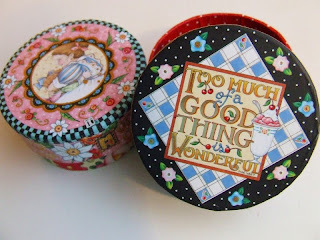 Then Colleen turned me onto these Candy Blocks which can really click together! They worked great for decoration, but unfortunately didn't come in enough shapes to make the 12. So here is what we came up with. The Professor picked out a Lethal Peppermint Chocolate Cake (it's amazingly pepperminty with a crushed peppermint buttercream filling and a peppermint ganache frosting...so good!!!) and I created a scene on top. Super easy! Thanks kid! 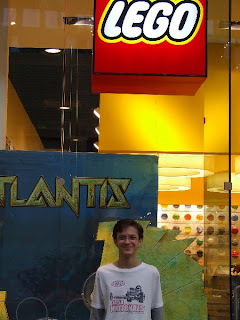 But of course, no LEGO birthday would be complete without a trip to the new LEGO store. Beaming, he was. Just beaming! 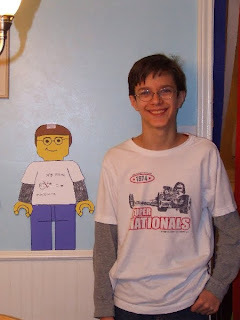 Check out Dylan's awesome LEGO self and please, let us see yours if you make some. We were thrilled to see his! Thanks Melissa and Dylan! Here are some examples if you need ideas for faces. New Lego store? Where? I'm so out of it. See what happens when you don't watch the news? LOL! And happy birthday to your big guy. 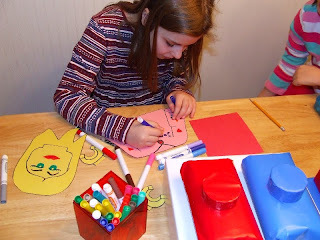 I saw so many wonderful ideas for celebrating birthdays and LEGOS with friends and family. Since our "parties" are only family parties and are very small, I didn't think we could pull some of them off. 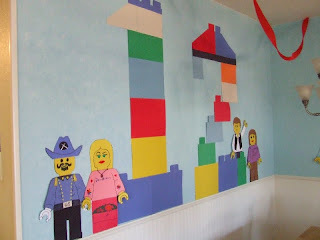 A pinata full of LEGOS sounds like a blast! Simply Brilliant! We just took our son to the Lego store up here. What a great party idea, now I'll just have to remember it for Sept.
What a very cool birthday theme! This is all so cool! 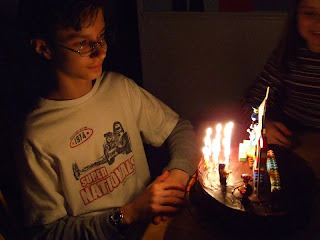 My son is a Lego fan too, and will be twelve this summer. Thanks for all the great ideas! Legos are the greatest! 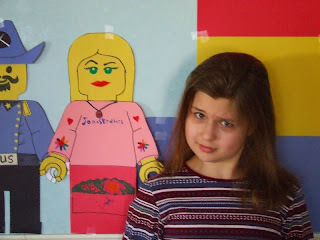 What other toy can girls and boys all different ages play and love? We did those building block cakes, only with my own recipe and they turned out great, but used a lot of food coloring to get the red block red! Your cake looks great! 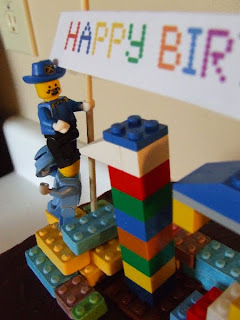 Happy birthday and many blessings to your lego boy! I LOVED seeing all the pictures!! You did an amazing job as usual! Happy Birthday to the Professor!! So creative!! What great mini-figs! Thanks so much for sharing. I can't believe the kids are getting so big.